We have been trying for baby #2 for about 9 months with no success. When we tried for J, we just assumed we were super fertile humans. We got pregnant the first month we tried. That ended in a miscarriage, which sucked, but the next month we tried we were pregnant again. Everyone was healthy and happy. So when we started trying again, we didn’t foresee any issues. Ha. Hahahahahhahahhahahahha! This is our first cycle. The good news is that, based on my BBT, I am 90% sure that I did ovulate. The bad news is that we may have missed the ovulation window due to travel. I will not be making that mistake again. Clomid isn’t horrible, but it is no walk in the park either. Here’s been my experience thus far. CD1 – AF comes to town, nothing unusual. CD 4 – Take Clomid, AF leaves town. CD 5 – Wake up DIZZY. Like, the room is spinning and I may throw up. Thankfully, this went away by lunch and I took my 1pm dose. CD 10 – Huge dip in BBT, major fight with B, bloated and crampy. CD 11 – Rise in BBT, really dislike B, for no reason, bloated and crampy, thinking maybe I ovulated. CD 12 – Dip in BBT. Well, that just pisses me off because I probably didn’t ovulate. I am extremely sensitive, which is not the norm. Seriously B, just stop talking. Also, had no energy/strength/motivation at crossfit. That just fueled the fire. CD 13 – Small rise in BBT. Realize that I feel normal again and apologize to B for yelling, snapping, and generally being mean. Still feeling bloated and crampy. CD 14 – Small dip in BBT. Feeling totally normal. The lens of normalcy helps me realize just how pissed I was at B – for no apparent reason. CD 15 – Major spike in BBT. CD 16 – Bloating goes away. CD 17 – BBT remains high. 90% sure I ovulated. Recap: From what I’ve read, a common side effect of Clomid is hot flashes. 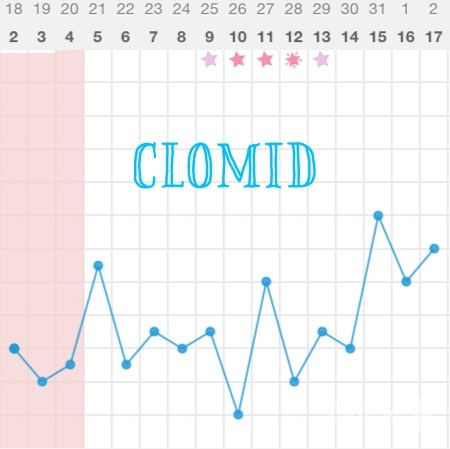 I did not experience any the first cycle of Clomid. That being said, Clomid made me really bloated and an unpleasant person for four days after my last dose until, this is my best guess, I ovulated. Once I ovulated, my mood regulated. While I am not looking forward to another round of Clomid, I will take it because it did it’s job. What are your Clomid experiences? Anyone get pregnant on their first round? Last night was my last night of taking Clomid for the first time. We see the doctor tomorrow and I’m hoping we will be able to get pregnant this month. I felt a little cramping too and under my left eye was very swollen. I wish you luck this month and please let us readers know how it goes. Thanks for stopping by! Good luck to you this month too! I haven’t heard about a swollen under eye before, just vision issues. It always amazes me how everyone has a unique experience. I got pregnant on my first month on Clomid, but unfortunately had an early miscarriage. I’m now on my 4th round. I feel like the hot flashes are worse this round than they have been before. Each month I have had crazy ovulation pain too, but in my head that’s just some reassurance that it’s doing its job well. Good luck! Thanks for stopping by ash0320! Good luck to you too this month! I’ve heard the hot flashes are brutal. Hopefully you won’t have to go through them again!